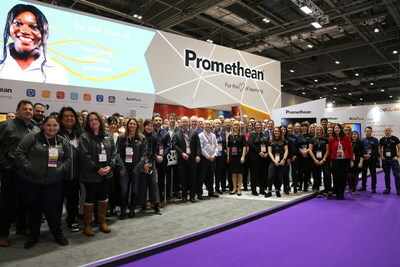 Global education technology provider, Promethean, has been named Company of the Year (over £3m turnover) in the Bett Awards 2019. The award ceremony, that took place last night at The Troxy, London, is a celebration of creativity and innovation throughout the education technology sector. The company's win in this coveted category demonstrates the success of Promethean over the last year, despite unprecedented budget cuts within education. Promethean's performance in this category is testament to its commitment to education and innovation, which has led to continued investment in developing market leading EdTech solutions. Ian Curtis, Promethean's Head of EMEA and Asia Pacific Markets, commented: "As a company with longstanding history in the EdTech market we've seen a lot of change in education over the years - and have worked hard to ensure that we evolve our solutions and support to continue to meet the needs of schools. We are extremely proud to be recognised as Company of the Year in the Bett Awards 2019 - it demonstrates that Promethean as a brand is much more than developing market-leading technology, it is great testament to our broader education pedigree and the commitment we continue to make in improving standards and opportunities in this vitally important sector." One of the reasons Promethean was recognised as Company of the Year is its commitment to meet the needs of schools today. With a core ethos to develop education-focused solutions, Promethean has not only evolved its range of ActivPanels but also provides access to a choice of lesson preparation and delivery software to offer teachers flexibility. Alongside investing in the development of both software and hardware, Promethean understands that pressured budgets can be a barrier to accessing the latest technology for schools. As a result of this, Promethean launched the Promethean Grant which has gone from strength to strength over the last two years. Encouraging creativity and giving back to education, the Grant is an opportunity for schools to win a state-of-the-art ActivPanel package. To learn more about Promethean, attendees to Bett 2018 should visit Stand B98 and C105 at the ExCel Centre in London. To learn more about Promethean at Bett, please visit http://www.prometheanworld.com. Promethean is a global education company that improves learning productivity by developing, integrating, and implementing innovative 21st-century learning environments. At Promethean, our goal is to reimagine and reinvent educational technologies that engage and empower the classroom, and we do it all for the love of learning. Promethean's main headquarters is located in Seattle, Wash. Promethean is a member of the Net Dragon Websoft Holdings Limited (HKSE: 0777) group of companies. For more information, please visit PrometheanWorld.com. NetDragon Websoft Holdings Limited (HKSE: 0777) is a global leader in building internet communities. Established in 1999, NetDragon is a vertically integrated, cutting-edge R&D powerhouse with a highly successful track record which includes the development of flagship MMORPGs including Eudemons Online, Heroes Evolved (formerly known as Calibur of Spirit) and Conquer Online. The company also established China's number one online gaming portal, 17173.com, and China's most influential smartphone app store platform, 91 Wireless, which was sold to Baidu in 2013 in what was at the time the largest Internet M&A transaction in China. Being China's pioneer in overseas expansion, NetDragon also directly operates a number of game titles in over 10 languages internationally since 2003. In recent years, NetDragon has emerged as a major player in the global online and mobile learning space as it works to leverage its mobile Internet technologies and operational know-how to develop a game-changing learning ecosystem. For more information, please visit http://www.netdragon.com.